Calendars were a necessary component of books which gave the prayers and scriptural readings for church services. Using the calendar, a priest or trained worshipper could determine, for example, what on what date Easter would fall, and which days in a year were Sundays. Also, the calendar lists, month-by-month, other church feasts and saints' days, all of which would have special readings and prayers, which would be assembled the book (missal or breviary). Medieval calendars use the Roman system of kalends, nones, and ides, the name of the month usually written beside 'Kl' for kalends. This calendar is a rare survival from an English parish church dating before the Reformation. It was at Ravensworth and Brompton on Swale in Yorkshire. Calendars are often regional, as revealed by the saints' feasts they give importance to, by writing the names in red letters ('red-letter days'). English saints, many with northern associations, are prominent in this calendar. From the top, St Thomas of Hereford, St Paulinus, St Wilfrid, and the Translation of Edward the Confessor are given the red-letter treatment. 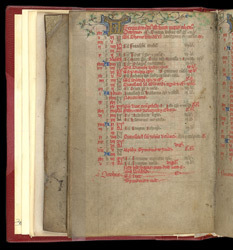 The symbols in the left margin are the 'golden numbers' (tell the informed which day Easter and related feasts fall on for a given year), the dominical letters (tell the days of the week), and the Roman system of kalends, nones and ides.